Out of the confusions of the mid seventies oil crisis, came two strands of thinking at Fiat. They still had a newly formed rally team and a recently acquired world class Abarth organisation. While in the real world potential car buyers were still reeling from the economic impacts and high petrol prices as aftershocks of the Middle East War. On the other side stood Abarth with a competition budget and Fiat backing to further exploit the growth in motorsport - rallying in particular. Some of Fiat's marketing managers could see the impact of the Lancia Stratos, and wanted to use Abarth to provide Fiat with similar world attention. So the history of rallying Fiats, and Abarth, and Lancia with its Bertone designed Stratos war machine become very intermixed. Its really only in the final chapters that the 131 appears. To begin with Abarth's brief was to find a replacement rally car to the 124 Abarth - and it had to be as quick as a Stratos! Several prototypes were developed – including the Prototipo X1/9, and 128 as well as the 131. For some time, it looked as though the Prototipo X1/9 would be the next car to carry the fight to world rallying. But in the end the 131 was chosen. The 131 is an even more glorious choice given the capability of the Stratos to trounce most of the rally competition of the time. By 1976 the Stratos had completed its third consecutive WRC championship win. Here’s a purpose built, only just a 2 seater, wedge shaped, V6 Ferrari mid-engined monster. And its replacement is…. a 131. The contrast in looks could hardly be greater. Anyway Fiat were about to go ‘toe to toe’ with Ford for the rally crown and, in Europe at least, we were trying to forget about the oil crisis and get back to burning some more hydrocarbons in pursuit of power… we needed some serious ‘wheels’ to do it! So Fiat wanted a car that the average buyer might identify with. In this sense having a purpose built dream car in the Stratos, and a ‘street’ credible 131 together makes a lot of sense. Enter Abarth. Many of the lessons learned by Abarth during the previous years of 124 Abarth Rally development were applied to the 131. In particular the rear suspension design is very similar, and the unreliable race inspired 16valve head from 1972 had evolved into a very reliable addition to the 1995cc engine, complete with Kugelfischer mechanical fuel injection. Abarth had been using the 131 (and a little later the Ritmo 1500s) as development test beds for their various programmes. 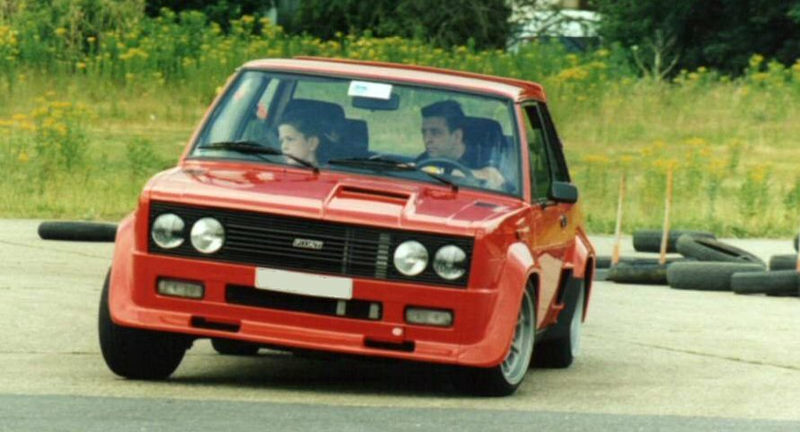 There are a range of 131 prototypes all usually bracketed under the 131 Abarth 035 in the books about this period… but actually a lot more prototypes were involved – including rally versions that had a few domestic rally outings. So we start with another Lancia - the Beta Montecarlo, only in 1972 it had not been decided which engine this should have. And Abarth took Fiat's V6 as the basis for testing. 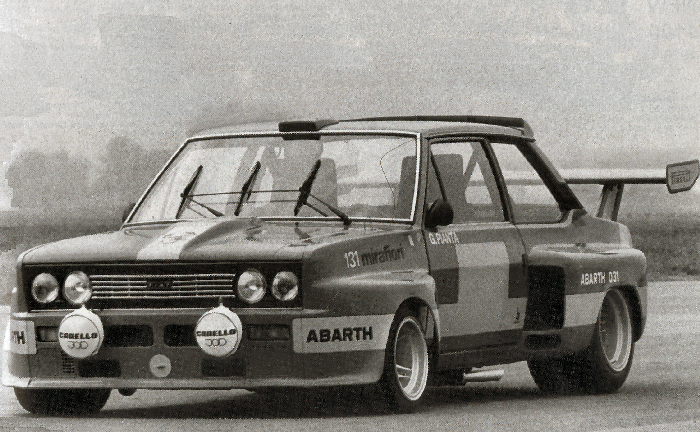 From late in 1973 Abarth had the first prototypes bodies of the 131 available. The 131 is a natural choice for motorsport testing - it has a big engine bay, rear wheel drive and enough room within each of its compartments to work easily, without being too wide or heavy. It was the last rear wheel drive saloon that Fiat produced in Italy. For the next two and a half years 131s featured in Abarth's testing, in fact throughout the development of the X1/9 Prototipos. 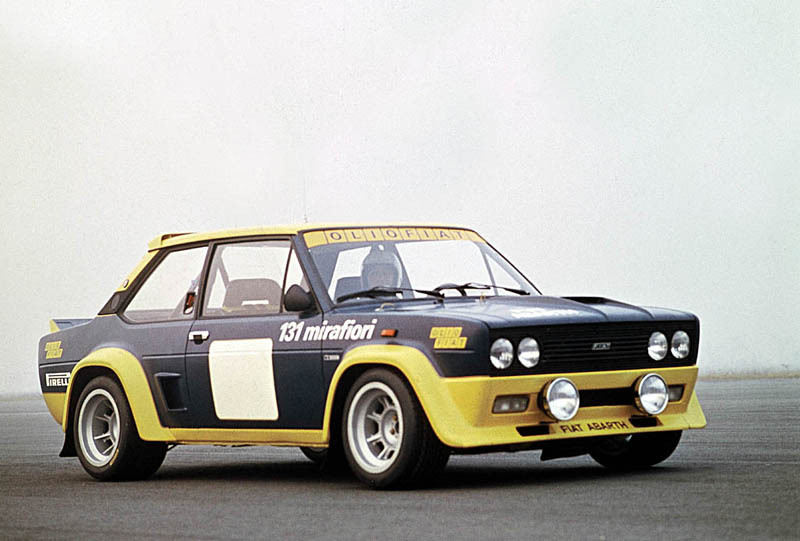 These were the first intended rally car replacement for the 124 Abarths. 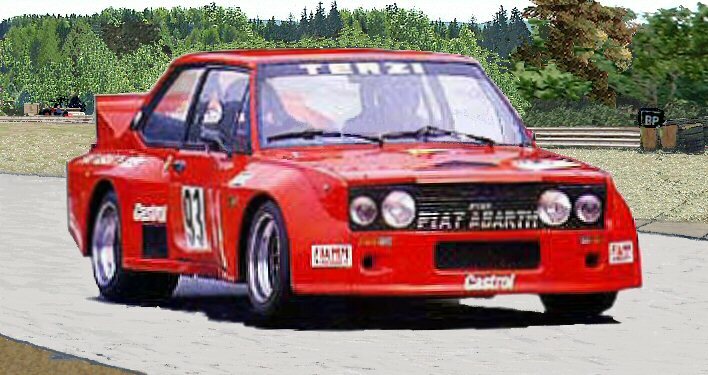 Only in 1975 does the 131 become the rally weapon of choice within Fiat. 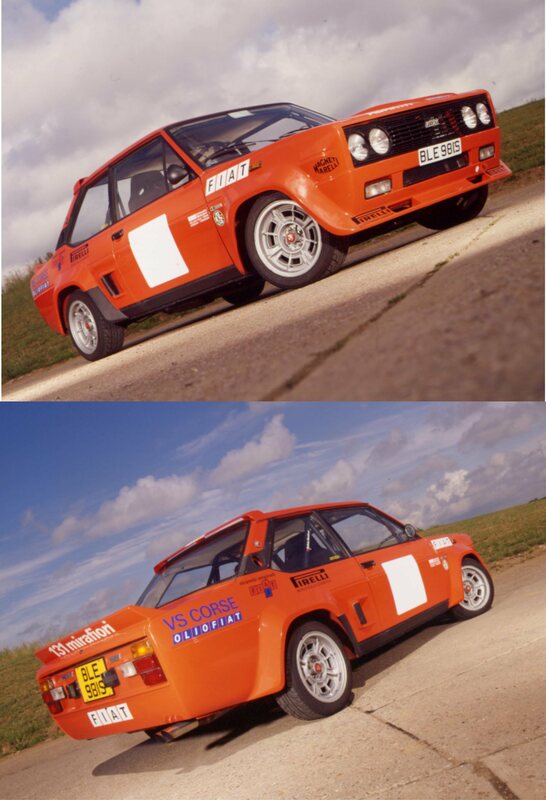 Bertone was tasked with assembling the 400 required to qualify (homologate) the 131 into the rally championship. 40 of these were taken in batches for Works preparation by Abarth. Later in the programme a further ten were used. The intention was to have the 131 ready for the first rally of the 1976 season. Its final season was in 1981. Just before the arrival of the Lancia 037 Abarth in 1982. The Abarth 030 was based on the Pininfarina X1/20 (later Lancia Beta Montecarlo/ Scorpion) and fitted with a modified version of the Fiat 130 Coupe V6 engine. It was at the moment when it looked as though Fiat might continue with their V6, and the Montecarlo might well have had one installed in the production cars. But the oil crisis of 1973 quashed that plan. In the 030, the V6 was bored out to give 3.5 litres, and was used as a development test bed by Abarth for the next two years. In 1974 Abarth had completed the first X1/9 prototypes using a bored out and 'stroked' engine to give an 1839cc Prototipo X1/9. Initially fitted with an 8 valve head, Abarth had plans to test a 16 valve head as soon as possible. Problems, however, in extracting reliable low rev - high torque output from the heads meant chamber/ valve re-design caused delays. But a satisfactory solution was achieved a year later. Their target was an international rally performance level to beat the Lancia Stratos. For a more detailed explanation of the X1/9 Prototipo see http://www.sfconline.org.uk/models/x1-9%20prototipo/x1-9prototipo.asp . Fiat's decision to use the commercially more acceptable 131 as a basis for their next rally weapon then meant the 16 valve head research was applied to the 131 Abarth's 2 litre twin cam instead. 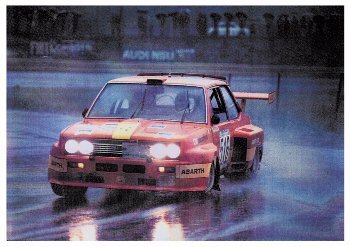 The 131 SE031 Abarth here (below) in action during the 1975 Giro d’Italia (Tour of Italy) had a V6 engine derived from the Fiat 130 Coupe. The Giro d’Italia was a magnificent event open to race rally and fast road cars alike – using race circuits and stages all around Italy. 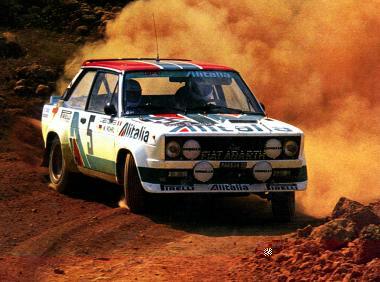 In 1975 this 031 won the saloon category of the event with Giorgio Pianta the Abarth test driver at the wheel (later also manager of the Abarth and then Lancia World Rally team efforts). The 131 body was a good choice for development, with a wide enough engine bay and rear wheel drive. The car's massive tyres were very necessary! Earlier in the 1975 season Pianta had tested the car commenting on the car's lack of stability at high speed. The Fiat V6, derived from their exploits with Ferrari and the Dinos, was designed as a cruiser rather than a motorsport engine and although providing plenty of mid-range torque has been commented on by other drivers as lacking a top end. In the 031 the engine was fitted with triple IDF Webers. The combination of Mr. Pianta, 031 and Fiat's resources ensured a comfortable saloon class win - despite several reported suspension, oil and fuel consumption, and gearbox problems. 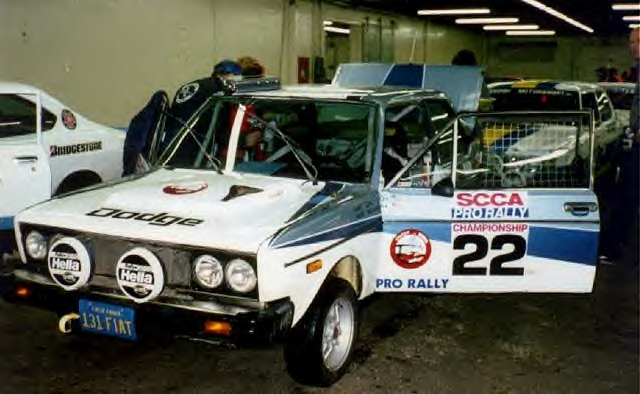 The SE031 was built as Fiat stepped up their budgets for the rally teams in 1974-75. Its engine was based around the type 130 B.000 in the Fiat 130 Coupe (produced between 1971 and 1977). In standard trim this was a V6 (60 degree) with bore and stroke of 102 x 66mm and 3235cc capacity, generating 165bhp DIN at 5,600rpm. Its fuel consumption was just over 19mpg. Which just about left it doomed following the oil crisis of 1973/4. For the SE031 the blocks were bored out to give 3.5 litres with a special triple IDF Weber inlet manifold, and racing exhaust manifold (as seen in the picture) with a short 3 into 1 exhaust on either side. This engine generated 270bhp at 6800rpm. ....With its rasping V6 exhausts, it was a very noisy car! The next 131 prototype - the 131 035 Abarth was fitted with an early Volumex supercharger based on a 16valve 1995cc Twin Cam. The capacity of the engine was also varied according to the regulations for its intended class. In the first instance the car was tested with a 1995cc capacity engine, but to keep within the 'under 2 litre' motorsport categories, forced induction engines carried a capacity penalty - so the capacity most often quoted for the 035 is 1452cc. This car also sported streamlined lightweight panels, and the car produced 290bhp with a top speed of 175mph. Made in 1979, it was entered for practice in the 1980 Le Mans 24 Hours race – driven by Pianta, but was not entered for the race itself. This was not as odd as may first appear, as it was relatively easy for Abarth to take the car, amongst the Lancia transporters and the Beta Montecarlos entered for the event for additional testing with the team already on hand. The 035 also stands astride two eras in Abarth history. It was clear to the designers that the next generation of world rally winners would need a 50% power increase from the same capacity engines - as it looked very likely that the performance loop-hole of using the old Group 4 rally/sports prototype category would continue in some form. This inevitably would mean using forced induction. Within the Fiat Group there was a debate about the means to achieve this. But as so often within the Group there was a political as well as engineering dimension to all of it. Following the Stratos years, Lancia had been excluded from competing in the world rally series while the Fiat 131 Abarth was 'in play'. Instead Lancia chose to build its brand by entering the Sports and Endurance world race series. In going head to head with the likes of Porsche, some of these Lancia sports-racers used naturally aspirated engines, while some successfully adopted smaller capacity engines with turbochargers. Furthermore, in 1981, Lancia's motorsport team found a sponsor in Martini who's distinctive livery and commitment was to last over a decade. So the debate over performance and reliability for the next world rally winner was between Abarth and their Volumex supercharger design, and Lancia with a form of the KKK type turbocharger familiar to their race team. Some technical doubts over the durability of the turbo and engine management coupled with a bigger Works design of Volumex supercharger meant Abarth won the design debate. 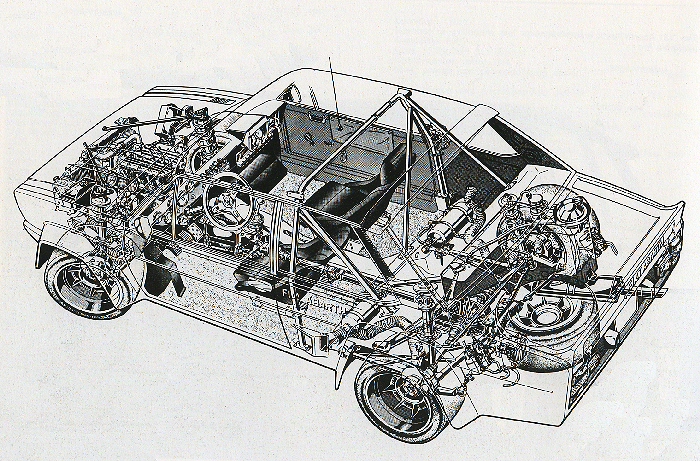 However it was to be installed in the Lancia 037 in 1981/2 - also the Abarth SE037. For more detailed discussions of the 037 see the Lancia 037 Model page. Abarth pulled together all their experience from the X1/9 prototipos, with a similar mid engined rally car design, to ensure the 037 was readied in record time. The two cars, the Fiat 131 035 Abarth, and the Lancia 037 Abarth represent the link between the normally aspirated Fiat twin cam and the Group B Lancia turbocharged 4 wheel drive eras. It was also the last two wheel drive World Rally Champion rally car. So when the call came from Fiat to prepare the 131 for World Rally winning, Abarth already knew a lot about the chassis, the car and its components. They were well down the road to achieve an outright winner. The body work for the 131 Abarth was designed by Bertone, using similar weight saving techniques they had practiced with Abarth on the X1/9 Prototipo. Thin GRP-fibre glass panels were used extensively, with perspex side and rear windows. The roll cage was kept to a minimal design, commensurate with its stiffening task. And these first attempts to reduce the car's weight achieved a tarmac event weight of 973kg. This is over 65kg lighter than the standard 131 Sport, but with the extra guards and heavier duty suspension mounts/equipment on gravel rallies, this weight goes up to 1028kg. A comparison with the Stratos power to weight figures is revealing, showing that in this important area, the 131 was in fact inferior to its 1973 sister car. In the early cars, the spring rates were in fact the same for both tarmac and gravel versions, it was the length of travel that differed according to the event. 7inch wide wheels were used on gravel rallies, except for the 6inch used on ice, and a variety of sizes used on the tarmac rallies, exploiting the split rim design to provide a range of widths up to 12 inches. Typically, for tarmac stages, the Works cars would run 10inch fronts and 11inch rears, depending upon the driver's preferences. The brakes were based around 12inch front and 10inch rear rotors, with twin rear calipers - the car having an additional hydraulic handbrake set. The gear box was a crash design (reduces the power loss in this era) with two sets of ratios homologated. Both were close ratio specs. There were also eight final drive options available, ranging between 6.6:1 and 3.9:1, also ZF supplied a limited slip differential. The Kugelfischer mechanically injected 1995cc engine produced between 205bhp and 210bhp at about 8000rpm - depending on the exhaust manifold and cams chosen. With a compression ratio of 8:1 Abarth recommended a rev limit of 8500rpm! Homologation into Group 4 of the Rally Championship required 400 road versions of the 131 Rally to be made. Lightweight body panels had been designed by Bertone who were given the assembly task too. In rally form the shell was some 50kg to 75kg lighter than standard – depending on the spec. for the particular rally. Abarth used the stiffer 2 door saloon. And in March 1976, all the preparations were complete. So the road going version of the 131 Abarth included a 1995cc twin cam, with a 16valve head, but with only one twin choke Weber carb. This generated about 140bhp @ 6400 rpm with a maximum of 130 lb/ft of torque at 3800 rpm. A 5 speed box was used, and Abarth homologated * rear axle ratios between 7/43 and 11/40 for competition. Power output from the Works Rally 131 was 215bhp @ 7000 rpm, with 166lb/ft of torque at 3800. As mentioned the Works cars also had a fully independent rear suspension, Kugelfischer mechanical injection, and a 5 speed ZF gearbox. This car won 3 of the next 4 World Championships in 1977, 78 and 1980. Body widths 1820mm – 1520mm front track, 1492mm rear track. Bosh - Kugelfischer mechanical fuel injection, first version had DCOE type throttle bodies and manifold. Weight distribution was about 50%:50% (front to rear) with crew on board. Abarth built three different body strengths for tarmac, forest/gravel strength, and rough (Safari etc). The weights vary accordingly; Early gravel models weighted 980 kg, late gravel models 1026 kg. The heavy re inforced ones continued to get heavier each season. The line drawing above shows the early style car layout - with the roll hoop behind the crew, and re inforcing the rear axle points only. By October 1975 Bertone had mostly completed the preparation of the 400 131 Abarth needed for FIA Homologation into the Group 4 category of the world rally championship. 50 of these cars were earmarked and duly dispatched to Abarth for Works preparation (Preparazione Corsa). The aim was to achieve a fully rally competitive car later during the 1976 season. The Works cars were developed in three states of trim/tune to meet the demands of the world's rallies, Snow and ice, Gravel and Tarmac. Although we might argue that the Safari Rally spec became a fourth special trim state later. They were not precise about the detailed spec of some of the cars - so you can find small variances in the specs on some of the photos of the time. The homologation changes gave Abarth some flexibility in the car specs they used, so that aluminum paneled doors, perspex side windows, additional lighting configurations with big or small spot lights can be seen. The size and finish of the can also be from another spec, and out of place to the purist. So the wide wheeled tarmac cars extended arches can be seen on other than tarmac events. 131 2000 ‘Volumetrico’ - SuperMirafiori Volumetric Abarth - and the last of the Line. 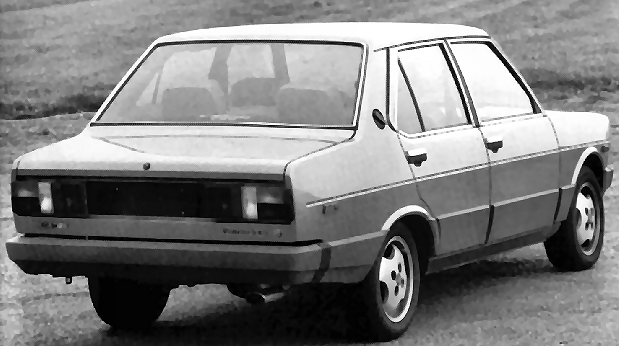 During the Summer of 1980 FIAT presented two more 131 prototypes to the European motoring press. These were based around 'blown' versions of the earlier 131 Racing/ Sport having supercharged 1300cc and 2000cc engines producing 115 and 142 bhp DIN respectively. The Abarth designed, positive displacement blower was belt driven and operated via a special Weber carburetor. This is a similar design to the supercharged versions of the 124 Spidereuropa and Lancia Beta Volumex but with a larger volume blower. In August 1981 these “Volumetrico’ 131’s were launched with 7.6:1 compression engines, oil cooler, electric fuel pump, special exhaust and a completely upgraded suspension and brake package. 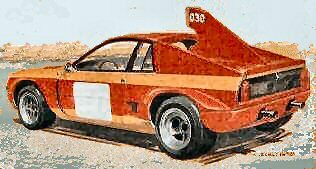 Their Pirelli ‘Plus One’ wheels and oval exhaust tail pipe were similar to the early 130tc Strada Abarth. All cars were assembled and prepared at Abarth. Other than the slightly lower ride height and rear ‘Volumetrico’ badges, there was little external difference to the standard SuperMirafiori series three. Except this one would take a lot more catching! Top speed was quoted at 101mph because of the 10/39 diff. ratio but, as with all the supercharged twin cams, the torque output was fantastic (21.8 mkg DIN at 3600rpm in comparison to the Rally 131 Abarth’s 18 mkg DIN!). 0 to 60 time is under 7 seconds. Fuel efficiency of the 2 litre was 24 to 27 miles per gallon. This bares comparison to any tuned twin cam prior to the modern Weber/ Marelli engine management systems. Impressive! The World Rally Championship was only just being formed under the FIA. It looks as though Lancia fully intended to run again in 1977 with the Stratos and had driver teams ready. 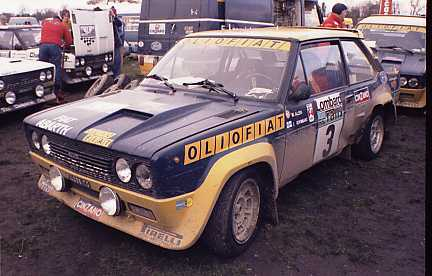 Fiat was the only manufacturer to announce its intention to compete in the 1977 WRC – which was for makes. A separate drivers championship existed. Lancia along with several other manufacturers entered drivers for the newly established FIA Cup for Rally Drivers – the forerunner of the World Rally Drivers Championship. This series involved a mix of WRC world rallies, European and National rallies to provide a global spread of events – more extensive than the Championship for Makes. 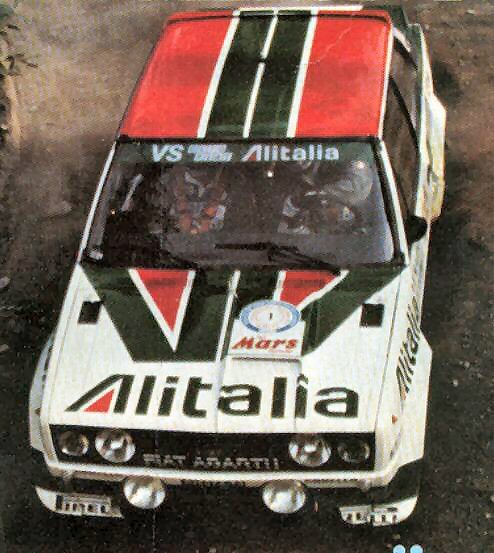 In the latter, Fiat planned to compete in all but one round - only excluding the Safari Rally from their campaign. Ford entered championship too. Plus Simo Lampinen driving when he wasn’t involved with Lancia or Saab. Walter Rohrl joined in Canada and Darniche & Mahe in the Fiat France car. Sandro Munari stayed with his Stratos in the FIA Cup. Simo Lampinen & Andreasson completed the team. WRC rounds 1977 in Monte Carlo, Portugal, New Zealand, Acropolis Greece, 1000 Lakes Finland, Criterium de Quebec Canada, Safari, Sanremo, Tour de Corse Corsica, RAC Rally GB. 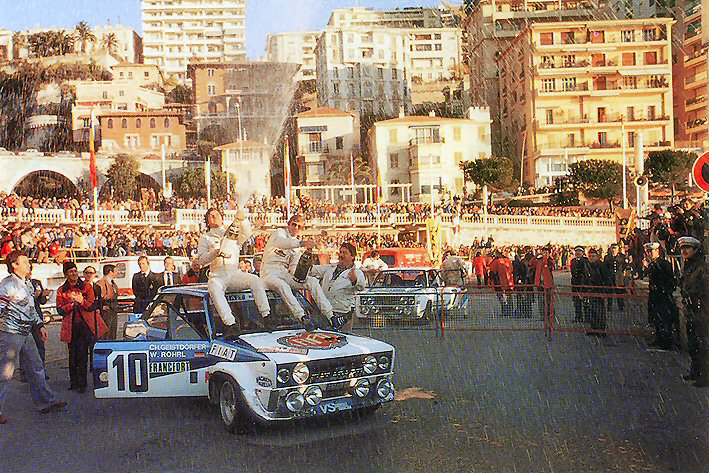 Monte Carlo - 22nd/29th Jan - saw Fiat Group enter 45 cars for the 45th Monte - after Alen was disqualified, and Bacchelli, Pinto, Darniche, & Rohrl all retired the Rally was won by Munari & Maiga in their Stratos. Jean Claude Andruet came second in a 131 Abarth (Fiat France). Swedish - 11th/23rd Feb - two 800km stages with 34 special trials. Won by Stig Blomqvist's Saab, best 131 was Lampinen & Andreasson in fourth. Portuguese - 1st/6th March - four stages 2,458km, and 46 special speed trials. Won by Alen & Kivimali with Andruet 4th and Verini 5th. Ford's efforts had been considerable too. Safari - 7th/11th April - No Fiat entry, Lancia Stratos Alitalias of Munari & Sodano, Lampinen & Andreasson, plus Kenyans Ulyate & Street. Mitsubishis and Peugeot 504s were fancied but the Ford of Waldegaard and Datsun of Aaltonen & Derwes took top honours. Ford and Fiat were llevel on 48 championship points, Opel on 39 and Lancia on 32pts. Acropolis - 30thMay/2ndJune - Fiat entered 8 x 131 Abarths! and all major teams were present. Fiats suspect diff casing caused three official entries to retire Lampinen came fourth. Waldegaard, Clark (Fords) and Kallstrum (Datsun) were on the podium. Ford led by 4 on 82 pts. 1000 Lakes - 26th/28th August - Only Alen's was officially there as last year's 131 winner taken out by a sabotage boulder. Ford 100pts Fiat 94. Quebec Criterion - 15th/19th September - 1500km with 543km of special speed trials. Allen, Lampinen and Rohrl in 131s. Salonen, Lampinen and Andreasson scored ahead of Clark. 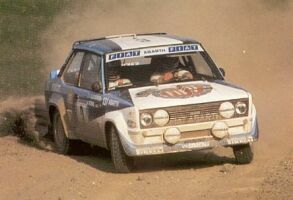 Ford 114 v Fiat 112. San Remo - 4th/8th October - heavy Fiat Group entry for their home rally, but the French entry 131 of Andruet & Delferrier won with Waldegard 5th. Fiat led again by six points. Tour de Corsa - 5th/6th November - Fiat & Lancia fielded 10 official entries. Heavy attrition could not deflect from the Darniche & Mahe win, with Pinto then Corello in the Stratos, Bacchelli and Vincent in fifth to block any heavy points scoring by Ford. Fiat had 136 points with Ford on 124 and Opel (64) and Lancia (60). Fiat were effectively world champions. RAC - 20th/24th November - Three 131s officialy entered with two others by the Autonovo Oy racing team (Makinen and Liddon) and one for Fiat UK for Lampinen. Starting at Wembley and finishing at York with 3057km and 69 special speed trials. All the major teams entered. Waldegard snatched victory in the final stages. From Mikkola & Hertz (Toyota), then Brooks Clarke and Dawson all driving Fords. WRC rounds in 1980 Monte Carlo, Portugal, Safari, Acropolis Greece, Codasur Argentina, Sanremo, Tour de Corse, Corsica, Ivory Coast, RAC Rally GB. Q Due to a considerable amount of sun damage to the fabric on the headrests and upper surfaces of my Abarth's interior I am now on the look out for a replacement interior, front and rear seats. I'd prefer the genuine original items, (with red stripes to match the colour of my car!) but as these are going to be extremely difficult to locate does anyone know of a good trimmer, or supplier of decent period looking bucket/racing seats. All (sensible) suggestions appreciated. Thanks, Simon.